What is exempt human subjects research? "Exempt" human subjects research is a sub-set of research involving human subjects that does not require comprehensive IRB review and approval because the only research activity involving the human subjects falls into one or more specific exemption categories as defined by the Common Rule. These changes reflect the recent trends in research oversight to reduce administrative burden on investigators and IRBs for minimal-risk research. If you have questions regarding the applicability of an exemption category to your proposed research, contact your U-M IRB for assistance prior to completing the IRB application. The following lists the high-level changes for each exemption category and identifies the potential exemption review paths at U-M based on criteria for that exemption category. Further details about each exemption are available in the Common Rule Change presentations from IRBMED and/or IRB-HSBS. What's New: A new ineligibility criterion will be added to this interaction/intervention exemption for research that involves possible "adverse effects" on student learning of the required education content and/or on the assessment of educators. Protected health information (PHI) (HIPAA regulated), which requires an IRB Determination with (often) a Privacy Board review. Review Path: The Self-determination* review path is permitted if the data collected is not sensitive or not identifiable; but Limited IRB Review is required if it is. A "benign intervention" is defined as one that is brief in duration, harmless, not physically invasive, painless, not embarrassing or offensive, and not likely to have a lasting adverse impact. This exemption adopts, but then modifies U-M Exemption 2a, which will be retired in July. The current federal exemption #3 will be eliminated. Review Path: An IRB Determination is required; however, if PHI is used then a Privacy Board review (HIPAA) is conducted with the IRB Determination. Review Path: An IRB Determination is required with validation from the U-M HRPP Director. Note: U-M will continue to apply exemption #5 to public benefit and service programs sponsored by the State of Michigan. Review Path: An IRB Determination is required. Note: U-M Exemption #7 will be retired due to the Common Rule change regarding continuing review. What's New: This new exemption allows for secondary research use/analysis of identifiable data/biospecimens that were collected under an approved IRB protocol with "Broad Consent". Selection of an exemption category will display the Exemption Details page, which is used to qualify the project for exemption or, if not qualified, to route the application to the next question in the comprehensive IRB review path. The Secondary Use application type will be renamed "Secondary research uses of private information and/or biospecimens". This application type is designed to route all secondary use studies through the correct IRB review and determination path (i.e., not regulated, exempt, or comprehesive IRB approval) based on the answers to the questions; eliminating the need for study teams to self-identify the required level of review. Note: all other application types (e.g., Not Regulated, Requesting Review by a Non-UM IRB, etc.) remain unchanged and will continue to be options in HUM section 1-1.1. Self-determination means that the Principal Investigator is permitted to issue a system-generated exemption determination letter based on responses to key questions within qualifying human subjects exemption categories. The IRB does not review self-determined projects. Investigators may choose not to apply self-determination but, instead, choose to submit a study for an IRB determination of exemption. In eRRM, this process will be similar to the one currently available for some Not Regulated projects. * If the research conducted by Michigan Medicine affiliates (and other units within the HIPAA covered entity) involves access to PHI data for the purposes of identifying potential subjects, then self-determination is NOT permitted. U-M will implement a post-determination validation process for self-determinations to ensure that the exemption criteria are being applied in accordance with regulatory requirements and that the potential risk to human subjects remains minimal. Limited IRB Review is a type of expedited review process required in the Common Rule. Its purpose is to ensure privacy/confidentiality protections are in place with exempt research that involves the collection or use of sensitive, identifiable data (exemptions 2, 3 and 8) and, for exemption 7, that "broad consent" was obtained and (if appropriate) documented according to an approved protocol. For exempt studies involving access to PHI (e.g., from medical records), the required Privacy Board review may be integrated with Limited IRB Review by the same assigned reviewer. The new Termination Report function in eRRM will be made available for exempt studies to close the study upon completion of the research. For details see: Termination Report. Existing Exempt studies will not be converted to the new "interaction/intervention" application type. Future amendments will be permitted for administrative changes only (i.e., for personnel changes or to record new funding for the project). For changes to the research design you will be required to file a new application. Existing Secondary Use studies will be converted to the new "Secondary research uses of private information and/or biospecimens" application type. Amendments for either administrative changes or for research design changes are allowed, but will require review and re-answer to some existing questions due changes within the application. Existing Standard studies will have the new "exemption screener" page added. At the next amendment, this page will be required. For unambiguously non-exempt projects, this means one new question. Some existing studies approved via full board or expedited review may now qualify for exemption under the 2018 Common Rule. The new exempt status can be determined via an amendment. New studies submitted for an exempt determination (including self-determination) after January 21, 2019 will utilize the new application types. The revised Common Rule will apply to these studies. IRB applications submitted for exempt determination shortly before January 21, 2019 may not be reviewed by the IRB in time to qualify under the current human subjects protection regulations. The U-M IRBs encourage study teams to submit applications well before January 21, 2019 or to delay submission to take advantage of the new application types and revised regulations. Check the IRB Metrics for median submission-to-approval turnaround times for exemptions to plan accordingly. Exempt applications in process at the time of transition will be returned to the study team to be updated using the new application types. 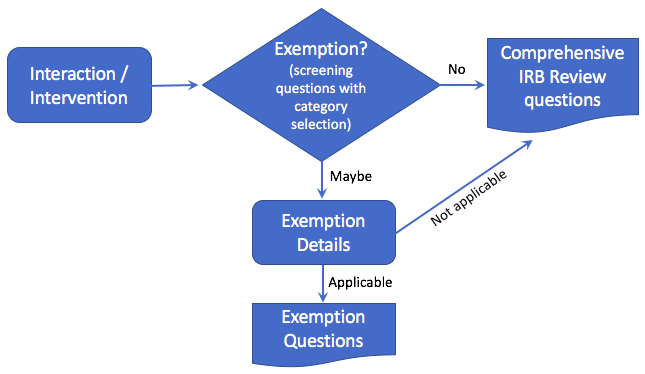 Decision trees displaying the criteria and potential review paths, including self-determination, for exempt categories 1 - 4, 7 & 8 under the 2018 Common Rule. Provides the full definition and explanation of exemption category #1 (educational exemption) under the 2018 Common Rule, including examples of the types of studies that qualify/do not qualify for this exemption. Provides the full definition and explanation of exemption category #2 (surveys, interviews, educational tests, and observations of public behavior exemption) under the 2018 Common Rule, including examples of the types of studies that qualify/do not qualify for this exemption. Provides the full definition and explanation of exemption category #3 (benign behavioral intervention) under the 2018 Common Rule, including examples of the types of studies that qualify/do not qualify for this exemption. U-MIC Presentation: Exemption Changes Under the Revised Common Rule (2018) [Download] Overview of the changes to the Exemption categories and review processes under the 2018 revised Common Rule (proposed effective date of January 21, 2019).